This Accenture career website is a good illustration of a glocal strategy. Accenture offers a similar website, system and design across the world, but a local translation and symbolic strong image in the background that make you feel immediately targeted. Like Michelin, the background image is dynamic. We can admire here the simplicity and direct access to the job search, based on keyword only. The challenge is then of course to use candidates’ language rather than corporate lingo in the job ads so that the jobseeker can get accurate results. If you look further into the website, despite of lot of scroll or swipe down, testimonials are interesting to find as they present professionals with concrete answers (changing from pure HR marketing motto) and related job offers. 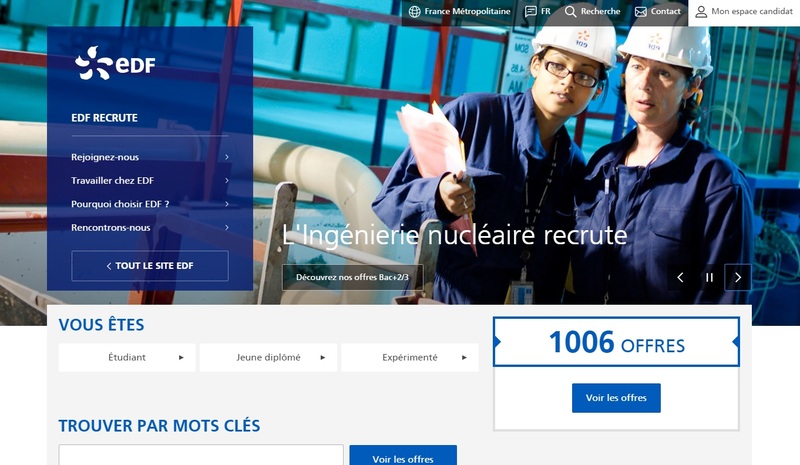 EDF’s new career pages are back in the new corporate website of the French energy leader. We can feel the ambition to better integrate international opportunities within EDF’s entities abroad even today, the English version often redirects you to content in French. However, it is also nice to see that the talent acquisition team is inviting visitor out, and shows its multichannel talent communication set-up. 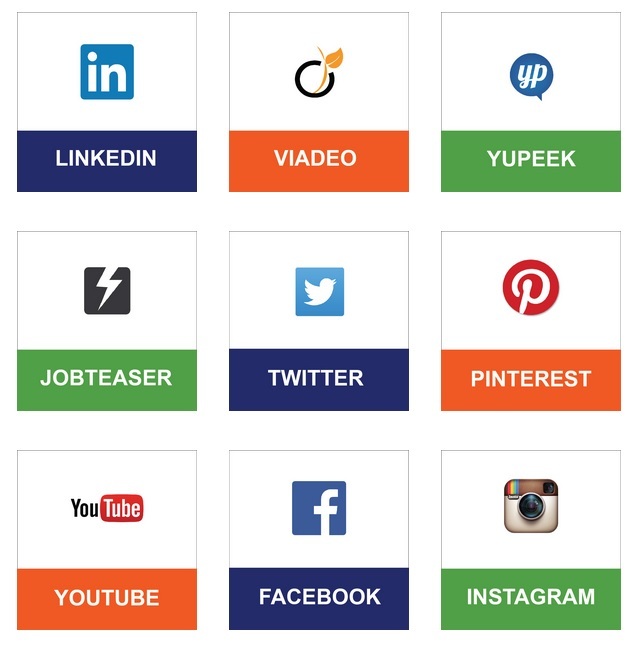 Potential candidates are able to pick their favourite or most accurate social media in order to be up-to-date when it comes to career opportunities at EDF. It is of course more challenging then to give a purpose to each channel and to be able to face the huge workload represented by content curation and community management, which should ideally be managed internally for genuine answers from recruiters and professionals. The Bibendum brand wants to show that they produce more than tires. 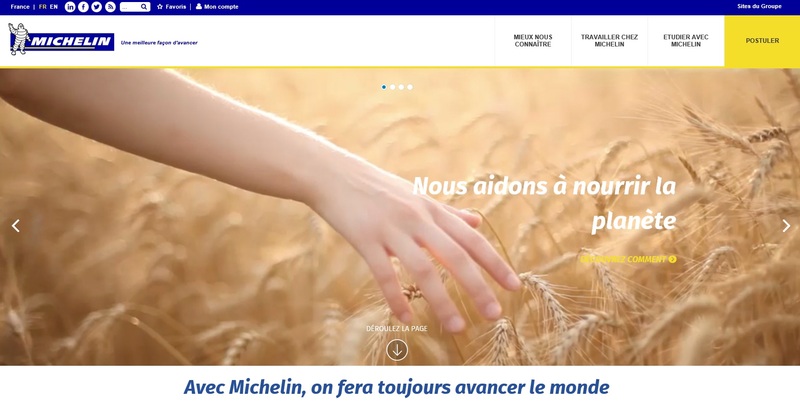 And the objective will probably be reached thanks to a new employer branding campaign showing the end impact of Michelin’s products and services. This campaign is probably shown at its best with the modern way of accessing the employees’ video testimonials as you can see below. The “Meet our team” section is then segmented in corporate missions rather than by functions or departments with strong tagline such as “We help the world to fly” or “We help to feed the planet”. Like a lot of fancy websites, we can only regret here the quite important loading time of pages and images. This is a challenge faced by a lot of companies nowadays. There is a bit less movement on the homepage of the last new born I wanted to share with you. 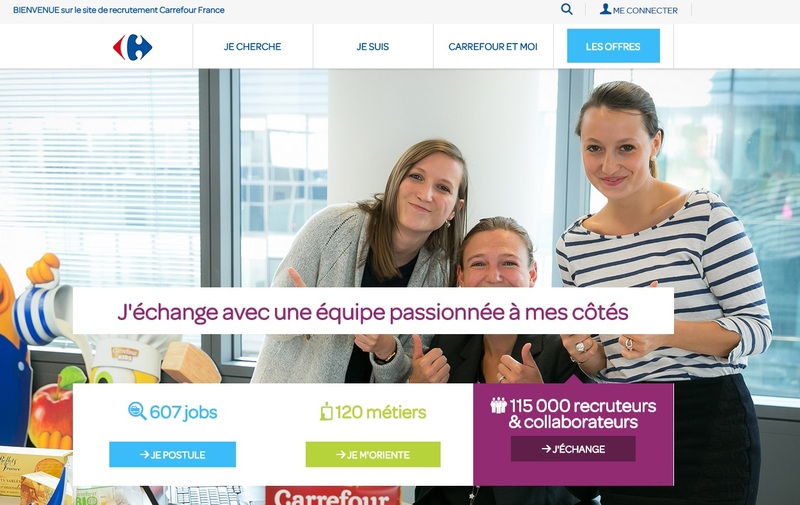 But interactive content and innovation are present all over the new website of Carrefour, the French leader in the supermarket industry. First of all, the navigation has a basic design but directly speaks to the visitor who can select and adapt the content depending on what s/he is looking for (“Je cherche”) or on who s/he is (“Je suis”). This navigation directs you to tailored content about functions, career paths, testimonials and related job offers that could match your profile. The job offers themselves are quite innovative enabling the visitor to discover the workplace, the time it gonna take to go to work in the morning, the relevant recruiting process or the department s/he would be working in. 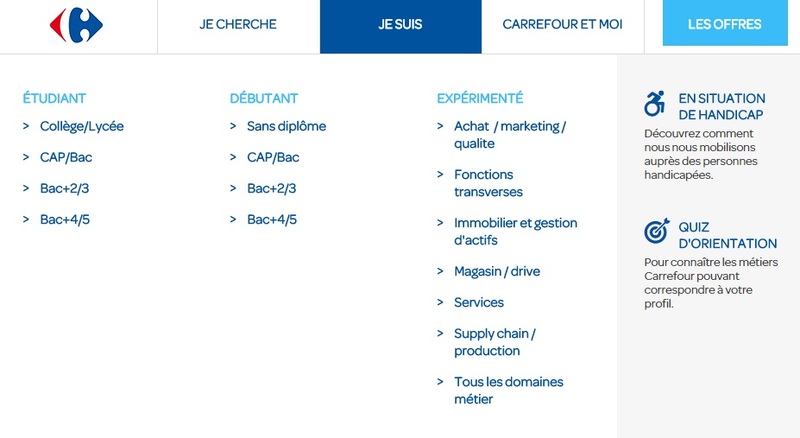 The only part that remains similar for all visitors is “Carrefour and me” and covers more generalist information about the company and its HR processes. Fully adapting a website to its visitor is something that career websites still struggle with, and we are curious to see new solutions in our fall evaluation when we check all career websites worldwide again. 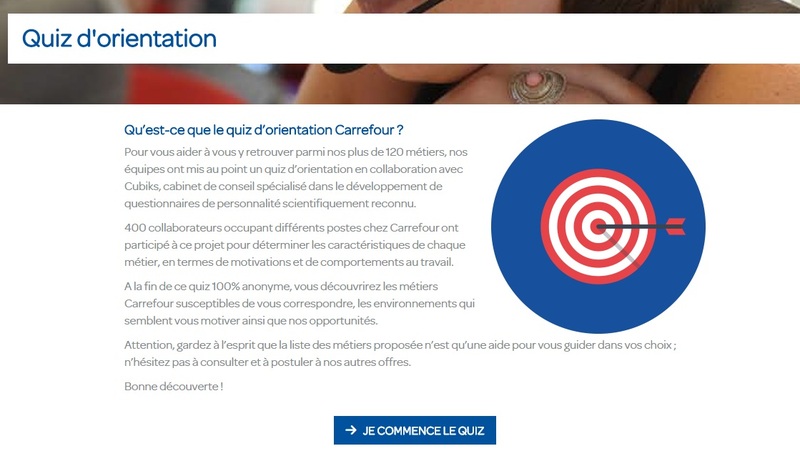 Talking about matching profiles, Carrefour also offers a guidance test, mixing hard and soft skills in order to better orientate candidates that rarely know how diverse careers can be in such a group. The risk with such a test is of course to cluster candidates to early or put spotlights on a limited amount of functions while they could have a broader potential. Of course, this list of innovations and relaunches is not exhaustive… I just wanted to offer you a short trip to France for summer. What about you? Are you ready for the back-to-school period? Are you ready for the OTaC 2016 shape-up deadline? You still have a few “calm” sunny weeks before the candidate storm hits back! the navigation has a basic design but directly speaks to the visitor who can select and adapt the content depending on what s/he is looking for (“Je cherche”) or on who s/he is (“Je suis”). This navigation directs you to tailored content about functions, career paths, testimonials and related job offers that could match your profile. This is a very good idea.thanks for sharing this article.